Members of the Carno Station Action Group, who are campaigning to reopen Carno Station, are celebrating a major landmark in their campaign after completing a full appraisal of their project for formal consideration by local authorities and the Welsh Assembly Government. Tony Burton, chairman of Carno Station Action Group, said “We believe this is a really significant step in our campaign to reopen our station”. Last year, the Enterprise and Learning Committee of the National Assembly for Wales considered the bid to reopen Carno Station and asked for a formal business case to be developed. Since then, Carno Station Action Group has been working hard to produce a draft business case in the form laid down by the new Welsh Transport Appraisal Guidance. 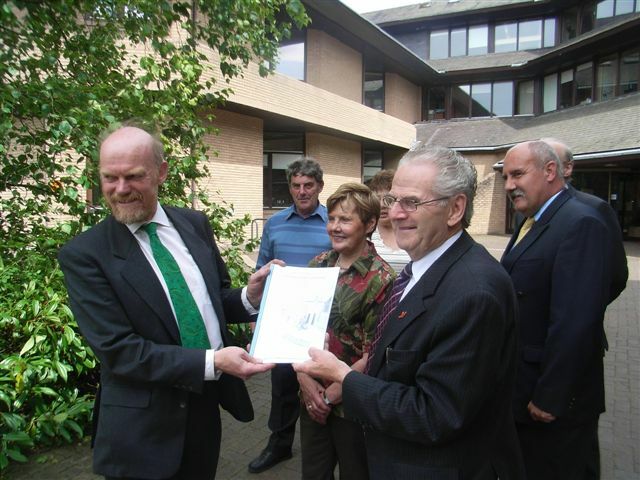 The result, entitled the Carno Transport Appraisal, has now been submitted to TraCC, the consortium of local authorities which implements the Welsh Assembly Government’s transport strategy in Mid Wales. 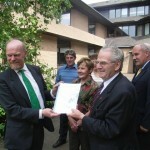 At 3.00 pm on Tuesday 1 July, 2008 the Action Group formally handed the document over to Councillor Gwilym Evans, Chairman of TraCC, at Powys County Hall. Councillor Evans thanked the Action Group for their hard work in putting the draft appraisal together, and noted that the timing of its submission could hardly be better, as the TraCC board was holding the first meeting of its new session a few days later, on Friday July 4th. 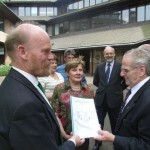 He assured the group that the document would receive close scrutiny. 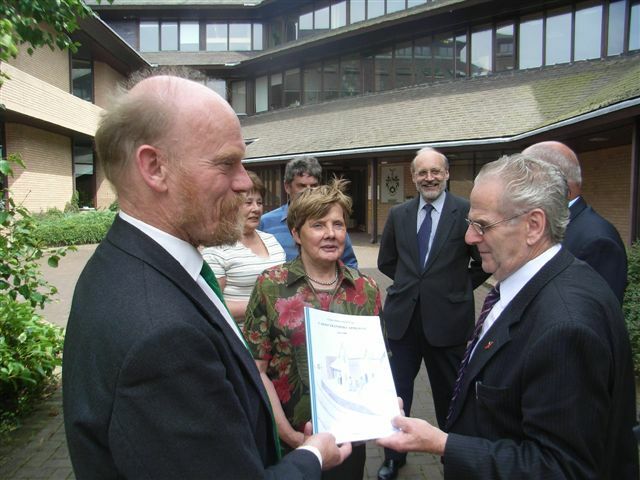 Tony Burton went on to say “We have followed Welsh Assembly Government Guidance in full in drafting this document for TraCC, looking at economic, social and environmental impacts and examining alternative proposals.” This will be the first transport project in Mid Wales to have had such an appraisal.